This class defines a model for the partitioning of a vector (or, in fact, any linear data structure) among processors using MPI. The partitioner stores the global vector size and the locally owned range as a half-open interval [lower, upper). Furthermore, it includes a structure for the point-to-point communication patterns. It allows the inclusion of ghost indices (i.e. indices that a current processor needs to have access to, but are owned by another process) through an IndexSet. In addition, it also stores the other processors' ghost indices belonging to the current processor (see import_targets()), which are the indices where other processors might require information from. In a sense, these import indices form the dual of the ghost indices. This information is gathered once when constructing the partitioner, which obviates subsequent global communication steps when exchanging data. The figure below gives an example of index space \([0,74)\) being split into four processes. Here process 0 will import 5 DoFs from process 1 (first pair of import targets), which corresponds to the first 3 elements of its import indices. Whereas process 2 will import 3 DoFs from process 0, which corresponds to the first two elements of its import indices. The partitioner includes a mechanism for converting global to local and local to global indices. Internally, this class stores vector elements using the convention as follows: The local range is associated with local indices [0,local_size), and ghost indices are stored consecutively in [local_size, local_size + n_ghost_indices). The ghost indices are sorted according to their global index. export_to_ghosted_array_start() is used for initiating an export operation that sends data from the locally owned data field, passed as an array, to a ghost data array according to the ghost indices stored in the present class. This call starts non-blocking MPI communication routines, but does not wait for the routines to finish. Thus, the user may not write into the respective positions of the underlying arrays as the data might still be needed by MPI. export_to_ghosted_array_finish() finalizes the MPI data exchange started in export_to_ghosted_array_start() and signals that the data in the arrays may be used for further processing or modified as appropriate. import_from_ghosted_array_start() is used for initiating an import operation that sends data from a ghost data field, passed as an array, to the locally owned array according to the ghost indices stored in the present class. A VectorOperation::values flag can be passed to decide on how to combine the data in the ghost field with the data at the owner, since both relate to the same data entry. In assembly, this is usually and add-into operation. This call starts non-blocking MPI communication routines, but does not wait for the routines to finish. Thus, the user may not write into the respective positions of the underlying arrays as the data might still be needed by MPI. import_from_ghosted_array_finish() finalizes the MPI data exchange started in import_from_ghosted_array_start() and signals that the data in the arrays may be used for further processing or modified as appropriate. The MPI communication routines are point-to-point communication patterns. This partitioner class operates on a fixed set of ghost indices and must always be compatible with the ghost indices inside a vector. In some cases, one only wants to send some of the ghost indices present in a vector around, but without creating a copy of the vector with a suitable index set - think e.g. 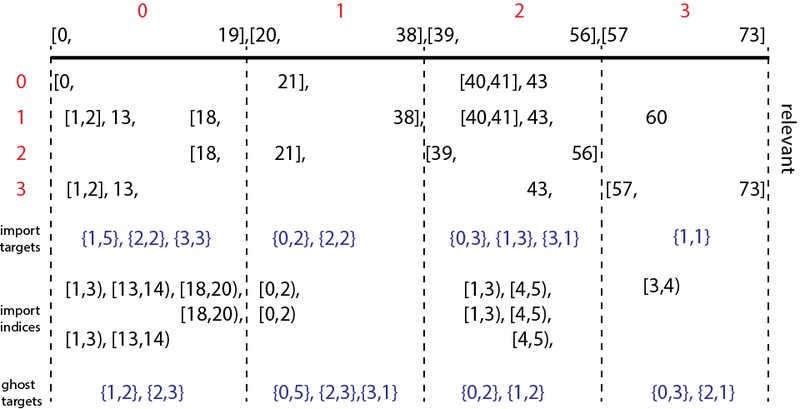 of local time stepping where different regions of a vector might be exchanged at different stages of a time step slice. This class supports that case by the following model: A vector is first created with the full ghosted index set. Then, a second Partitioner instance is created that sets ghost indices with a tighter index set as ghosts, but specifying the larger index set as the second argument to the set_ghost_indices() call. When data is exchanged, the export_to_ghosted_array_start() and import_from_ghosted_array_start() detect this case and only send the selected indices, taken from the full array of ghost entries. Definition at line 25 of file partitioner.cc. Constructor with size argument. Creates an MPI_COMM_SELF structure where there is no real parallel layout. Definition at line 40 of file partitioner.cc. Constructor with index set arguments. This constructor creates a distributed layout based on a given communicators, an IndexSet describing the locally owned range and another one for describing ghost indices that are owned by other processors, but we need to have read or write access to. Definition at line 60 of file partitioner.cc. Constructor with one index set argument. This constructor creates a distributed layout based on a given communicator, and an IndexSet describing the locally owned range. It allows to set the ghost indices at a later time. Apart from this, it is similar to the other constructor with two index sets. Definition at line 79 of file partitioner.cc. Reinitialize the communication pattern. The first argument vector_space_vector_index_set is the index set associated to a VectorSpaceVector object. The second argument read_write_vector_index_set is the index set associated to a ReadWriteVector object. Definition at line 97 of file partitioner.cc. Set the locally owned indices. Used in the constructor. Definition at line 110 of file partitioner.cc. Set the ghost indices after the constructor has been called. The optional parameter larger_ghost_index_set allows defining an indirect addressing into a larger set of ghost indices. This setup is useful if a distributed vector is based on that larger ghost index set but only a tighter subset should be communicated according to ghost_indices. Definition at line 151 of file partitioner.cc. Return the local size, i.e. local_range().second minus local_range().first. Return an IndexSet representation of the local range. This class only supports contiguous local ranges, so the IndexSet actually only consists of one single range of data, and is equivalent to the result of local_range(). Return the local range. The returned pair consists of the index of the first element and the index of the element one past the last locally owned one. Return true if the given global index is in the local range of this processor. Return the local index corresponding to the given global index. If the given global index is neither locally owned nor a ghost, an exception is thrown. Note that the local index for locally owned indices is between 0 and local_size()-1, and the local index for ghosts is between local_size() and local_size()+n_ghost_indices()-1. Return the global index corresponding to the given local index. Return whether the given global index is a ghost index on the present processor. Returns false for indices that are owned locally and for indices not present at all. Return an IndexSet representation of all ghost indices. Return the number of ghost indices. Same as ghost_indices().n_elements(), but cached for simpler access. In case the partitioner was built to define ghost indices as a subset of indices in a larger set of ghosts, this function returns the numbering in terms of ranges within that set. Similar structure as in an IndexSet, but tailored to be iterated over. In case the partitioner did not take a second set of ghost indices into account, this subset is simply defined as the half-open interval [0, n_ghost_indices()). Return a list of processors (first entry) and the number of ghost degrees of freedom owned by that processor (second entry). The sum of the latter over all processors equals n_ghost_indices(). Return a vector of ranges of local indices that we are importing during compress(), i.e., others' ghosts that belong to the local range. Similar structure as in an IndexSet, but tailored to be iterated over, and some indices may be duplicated. The returned pairs consists of the index of the first element and the index of the element one past the last one in a range. Number of import indices, i.e., indices that are ghosts on other processors and we will receive data from. Return a list of processors (first entry) and the number of degrees of freedom imported from it during compress() operation (second entry) for all the processors that data is obtained from, i.e., locally owned indices that are ghosts on other processors. the returned vector only contains those processor id's for which the second entry is non-zero. Check whether the given partitioner is compatible with the partitioner used for this vector. Two partitioners are compatible if they have the same local size and the same ghost indices. They do not necessarily need to be the same data field. This is a local operation only, i.e., if only some processors decide that the partitioning is not compatible, only these processors will return false, whereas the other processors will return true. Definition at line 502 of file partitioner.cc. Check whether the given partitioner is compatible with the partitioner used for this vector. Two partitioners are compatible if they have the same local size and the same ghost indices. They do not necessarily need to be the same data field. As opposed to is_compatible(), this method checks for compatibility among all processors and the method only returns true if the partitioner is the same on all processors. This method performs global communication, so make sure to use it only in a context where all processors call it the same number of times. Definition at line 529 of file partitioner.cc. Return the MPI ID of the calling processor. Cached to have simple access. Return the total number of MPI processor participating in the given partitioner. Cached to have simple access. Return the MPI communicator underlying the partitioner object. Return whether ghost indices have been explicitly added as a ghost_indices argument. Only true if a reinit call or constructor provided that argument. Start the exports of the data in a locally owned array to the range described by the ghost indices of this class. communication_channel Sets an offset to the MPI_Isend and MPI_Irecv calls that avoids interference with other ongoing export_to_ghosted_array_start() calls on different entries. Typically handled within the blocks of a block vector. locally_owned_array The array of data from which the data is extracted and sent to the ghost entries on a remote processor. temporary_storage A temporary storage array of length n_import_indices() that is used to hold the packed data from the locally_owned_array to be sent. Note that this array must not be touched until the respective export_to_ghosted_array_finish() call has been made because the model uses non-blocking communication. ghost_array The array that will receive the exported data, i.e., the entries that a remote processor sent to the calling process. Its size must either be n_ghost_indices() or equal the number of ghost indices in the larger index set that was given as second argument to set_ghost_indices(). In case only selected indices are sent, no guarantee is made regarding the entries that do not get set. Some of them might be used to organize the transfer and later reset to zero, so make sure you do not use them in computations. requests The list of MPI requests for the ongoing non-blocking communication that will be finalized in the export_to_ghosted_array_finish() call. This functionality is used in LinearAlgebra::distributed::Vector::update_ghost_values(). Finish the exports of the data in a locally owned array to the range described by the ghost indices of this class. ghost_array The array that will receive the exported data started in the export_to_ghosted_array_start(). This must be the same array as passed to that function, otherwise the behavior is undefined. requests The list of MPI requests for the ongoing non-blocking communication that were started in the export_to_ghosted_array_start() call. This must be the same array as passed to that function, otherwise MPI will likely throw an error. Start importing the data on an array indexed by the ghost indices of this class that is later accumulated into a locally owned array with import_from_ghosted_array_finish(). vector_operation Defines how the data sent to the owner should be combined with the existing entries, e.g., added into. communication_channel Sets an offset to the MPI_Isend and MPI_Irecv calls that avoids interference with other ongoing import_from_ghosted_array_start() calls on different entries. Typically handled within the blocks of a block vector. ghost_array The array of ghost data that is sent to a remote owner of the respective index in a vector. Its size must either be n_ghost_indices() or equal the number of ghost indices in the larger index set that was given as second argument to set_ghost_indices(). This or the subsequent import_from_ghosted_array_finish() function, the order is implementation-dependent, will set all data entries behind ghost_array to zero. temporary_storage A temporary storage array of length n_import_indices() that is used to hold the packed data from MPI communication that will later be written into the locally owned array. Note that this array must not be touched until the respective import_from_ghosted_array_finish() call has been made because the model uses non-blocking communication. This functionality is used in LinearAlgebra::distributed::Vector::compress(). Finish importing the data from an array indexed by the ghost indices of this class into a specified locally owned array, combining the results according to the given input vector_operation. temporary_storage The same array given to the import_from_ghosted_array_start() call that contains the packed data from MPI communication. In thus function, it is combined at the corresponding entries described by the ghost relations according to vector_operation. ghost_array The array of ghost data that is sent to a remote owner of the respective index in a vector. Its size must either be n_ghost_indices() or equal the number of ghost indices in the larger index set that was given as second argument to set_ghost_indices(). This function will set all data entries behind ghost_array to zero for the implementation-dependent cases when it was not already done in the import_from_ghosted_array_start() call. locally_owned_storage The array of data where the resulting data sent by remote processes to the calling process will be accumulated into. requests The list of MPI requests for the ongoing non-blocking communication that have been initiated in the import_to_ghosted_array_finish() call. This must be the same array as passed to that function, otherwise MPI will likely throw an error. Compute the memory consumption of this structure. Definition at line 538 of file partitioner.cc. Initialize import_indices_plain_dev from import_indices_data. This function is only used when using CUDA-aware MPI. Definition at line 584 of file partitioner.h. The range of the vector that is stored locally. Definition at line 589 of file partitioner.h. The range of the vector that is stored locally. Extracted from locally_owned_range for performance reasons. Definition at line 596 of file partitioner.h. Definition at line 602 of file partitioner.h. A variable caching the number of ghost indices. It would be expensive to use ghost_indices.n_elements() to compute this. Definition at line 608 of file partitioner.h. Definition at line 614 of file partitioner.h. The set of (local) indices that we are importing during compress(), i.e., others' ghosts that belong to the local range. Similar structure as in an IndexSet, but tailored to be iterated over, and some indices may be duplicates. Definition at line 622 of file partitioner.h. The set of (local) indices that we are importing during compress(), i.e., others' ghosts that belong to the local range. The data stored is the same than in import_indices_data but the data is expanded in plain arrays. This variable is only used when using CUDA-aware MPI. Definition at line 636 of file partitioner.h. A variable caching the number of ghost indices. It would be expensive to compute it by iterating over the import indices and accumulate them. Definition at line 642 of file partitioner.h. Definition at line 648 of file partitioner.h. An array that caches the number of chunks in the import indices per MPI rank. The length is import_indices_data.size()+1. Definition at line 654 of file partitioner.h. A variable caching the number of ghost indices in a larger set of indices given by the optional argument to set_ghost_indices(). Definition at line 660 of file partitioner.h. An array that caches the number of chunks in the import indices per MPI rank. The length is ghost_indices_subset_data.size()+1. Definition at line 666 of file partitioner.h. The set of indices that appear for an IndexSet that is a subset of a larger set. Similar structure as in an IndexSet within all ghost indices, but tailored to be iterated over. Definition at line 674 of file partitioner.h. Definition at line 679 of file partitioner.h. Definition at line 684 of file partitioner.h. Definition at line 689 of file partitioner.h. A variable storing whether the ghost indices have been explicitly set. Definition at line 694 of file partitioner.h.